Wine saved lives. That’s the heart of the story behind the Hospices de Beaune, one of the most ancient wine auctions in the world. 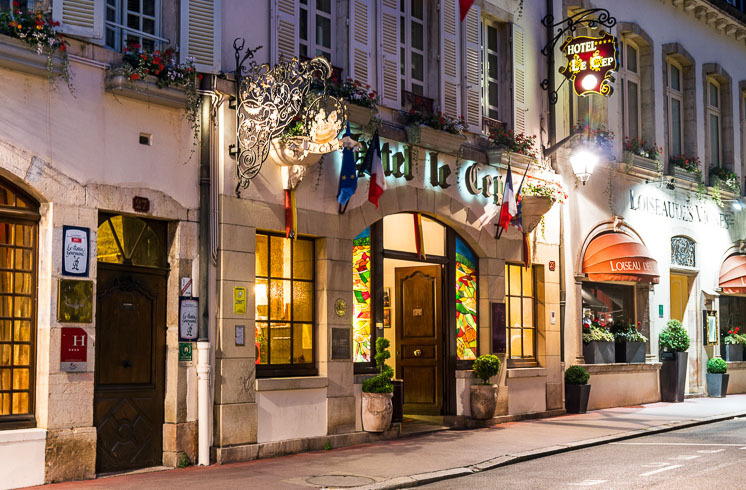 It’s a fascinating sequence that begins with medieval poverty and plague but comes to age with abundance and luxury in the Burgundy region of France. 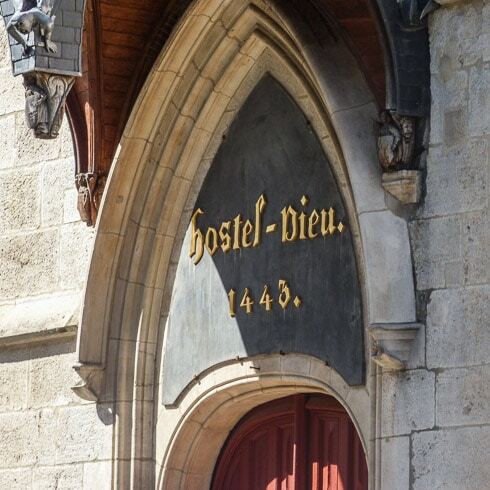 In 1443, the Hôtel-Dieu (which translates literally to “Hotel of God,” or hospital: Hospices de Beaune) was founded as a refuge for the poor, many of them war-torn and infected by the plague. 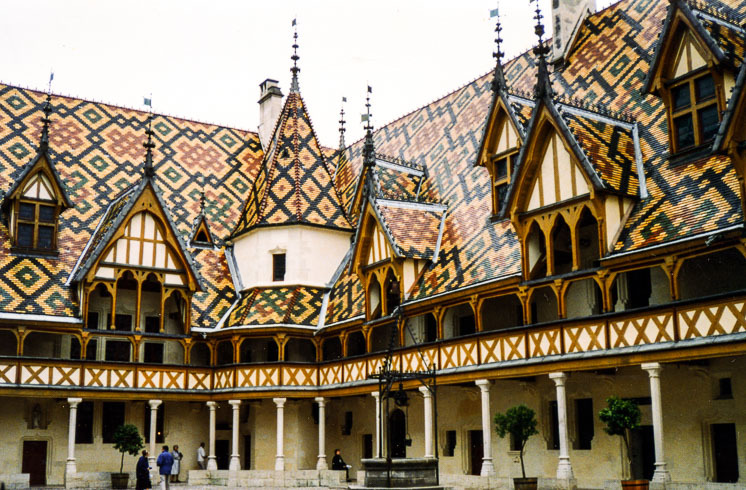 More beautiful than most, the Hospices de Beaune boasted Gothic architecture and varnished, polychrome tile roofs. But it wasn’t the building’s beauty that propelled this institution to fame—it all began with the actions of a winegrower named Jean Guillotte le Verrier. It was 1457 when Jean Guillotte le Verrier donated some of his vines to the Hôtel-Dieu. 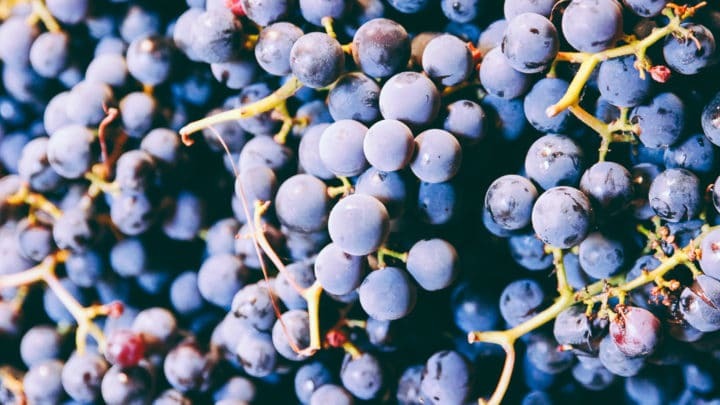 The vines were intended to generate income for the hospital; funds from the sale of wine produced with the fruit of these vineyards were earmarked for hospital expenses. Over the years, locals followed suit by donating vines either in gratitude for their own healing or for the good of the community. The tradition continued until the hospital retired into its current incarnation—a museum—in the 1970s. Today, the estate comprises over 60 hectares of vines in some of the most treasured climats (a term for specific parcels of vines) in all of France. But what of all the wine? The Hospices de Beaune estate (most of it Grand Cru and Premier Cru) and its prestigious wines produced by 22 hand-chosen winemakers are utterly famous. The wines are sold annually at auction on the third Saturday of November in an event conducted by Christie’s auction house. The proceeds of the sale are still used in a non-profit fashion for the conservation of the historic Hôtel Dieu. There is also a charity lot, the Pièce des Présidents, proceeds from which are generally the highest in the auction and are donated to a very small number of select organizations each year. This auction is one of the premier annual traditions of the wine trade, and it sets the tone for the new vintage. Bidders have the option of purchasing wine en premier—this means that the current vintage is sold right in the barrel. Each buyer must be or have a professional company authorized to age and bottle the wine. All of the wine from the current Hospices de Beaune vintage is auctioned at this single event. And, it carries cultural importance: the auction is part of an ancient program called Les Trois Glorieuses which marks the ceremonial end of the Burgundy wine harvest season. It’s three days of revelry founded by La Confrérie des Chevaliers du Tastevin, an order of honorary knights that preserve and promote traditional Burgundy winemaking culture. The festivities begin with a banquet at the ancient and revered Clos Vougeot, followed by the Hospices de Beaune wine auction. The festivities wrap up with La Paulée at the Château de Meursault, a lunch-to-evening dining extravagance. Hôtel Le Cep in Beaune. 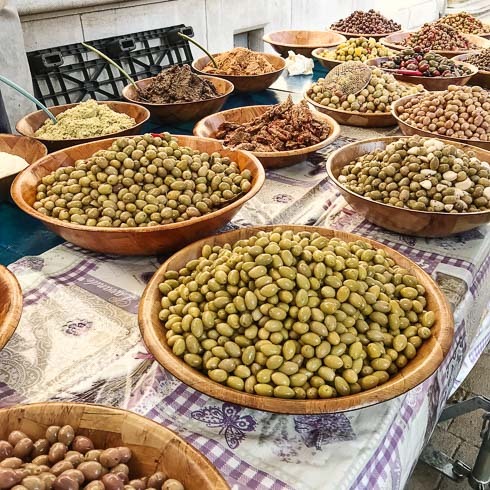 Olives at the market in Beaune. Beaune is a charming town of innovative restaurants, antique and art galleries, and wine shops on ancient cobbled streets. The village is busy with events during the week of the auction, including street performances, food, parades, concerts, and a vineyard-to-village half-marathon. In tasting rooms and vineyards all around town, domaines present wine events where anyone can sample vintages old and new. For those not attending the auction, a trip to Beaune still offers total immersion into the excitement. “Outside the auction hall, a jumbotron plays the auction proceedings to crowds jostling for vantage points throughout the adjacent town square and surrounding outdoor cafes,” says Archer. If you need a primer to understand the composition of the Côte de Beaune and Côte de Nuit vineyards, head to the Maison des Climats, an interactive exhibition housed in the Beaune tourism office. Cécile Mathiaud, representing the Bourgogne Wine Board, recommends a stop before heading out to visit the different domaines. This year, a special audio exhibit expressing the oral history of local vignerons (grape growers and winemakers) will be located temporarily in Beaune during auction week. 2017 was a record-breaking auction, reaching $16M for 787 barrels, with prices increased by 8.6% overall compared to 2016. The 2017 Pièces des Présidents sold for $495,600, the second-highest price ever recorded. 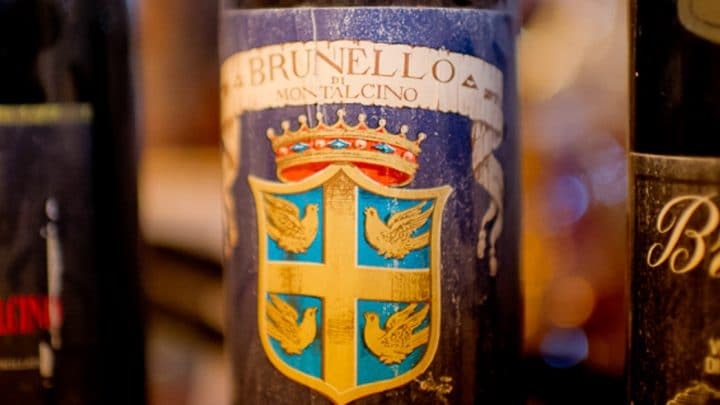 Wine enthusiasts around the world are waiting to see what astonishing prices are accepted this year, eager to experience the timelessness of this event. Want to see it for yourself? Visit the Côte de Beaune and Côte de Nuits vineyards on a Burgundy 4-Day Bike Tour, Burgundy Bike Tour, or private Burgundy + Bordeaux Bike Tour, designed to coincide with the auction week.